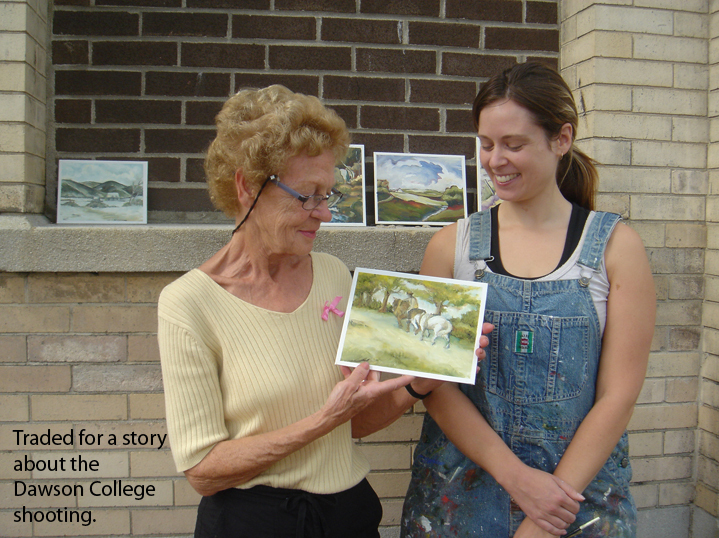 The dialogue began as soon as the public realized that she was not in fact painting the sunny Lachine Canal in front of her, but a fall prairie landscape, a rushing waterfall, an oil field from the 1930’s, or a cottage buried in the snow. As the onlookers’ curiosity was piqued, a discussion ensued regarding the originality of artworks, the history of Canadian painting, conceptual art work and performance versus traditional media. The onlookers directed the discussion (in order to avoid the temptation to “inform” the public on contemporary art practices) and the subject matter often turned to intimate details of life, creative desires and occasionally, zodiac signs. In the end, meaningful exchanges were the product of the very simple gesture of setting up an easel and presenting the public with the unexpected. This is not a project about painting, and those paintings that were the by-product of the experience presented a source of discomfort and confusion for those who wanted to purchase them but were unable to name a price or value. Those who were brave enough to offer an exchange happily departed with a souvenir of the experience. Canadian Art : Catalogue of the National Gallery of Canada. Vol. 2 / G-K. Ed. Pierre B. Landry. Ottawa : National Gallery of Canada, 1994. There is a full citation on the verso of each painting. 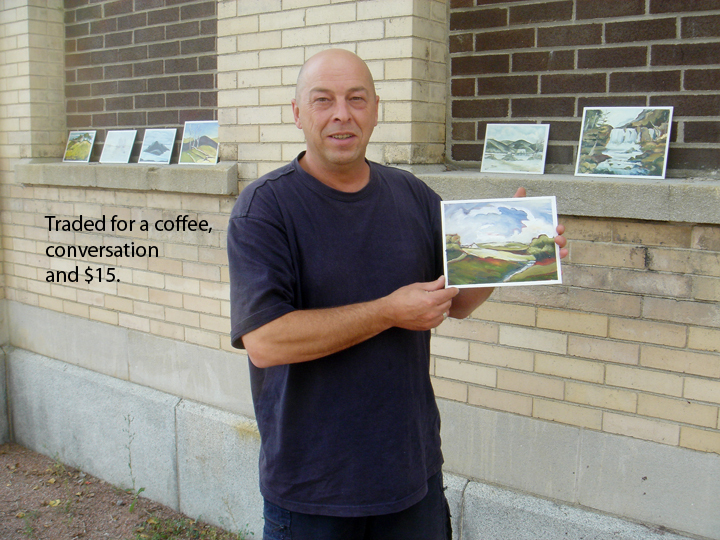 This series has taken place at the Atwater Market in Montreal, as well as outside La Centrale Galerie Powerhouse during the annual sidewalk sale on St-Laurent Boulevard. This entry was posted on	September 18, 2006 at 10:28 pm	and is filed under CRUM Projects.